British Ambassador to Mexico Duncan Taylor was on hand at the Puerto Vallarta Airport Thursday to greet holiday makers from the United Kingdom arriving on the first direct scheduled flight from the European island nation to land in Jalisco. The Thomson Fly flight left London Gatwick at 10:30 a.m. on Thursday and touched down in Vallarta the same day at 4:15 p.m, after an 11 hour 40 minute flight. 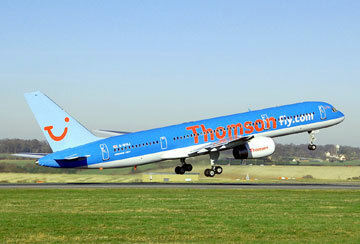 The Thomson Fly flights will leave Gatwick and Manchester airports on Thursdays and Saturdays. The planes will be filled mostly with British vacationers on Thomson holiday packages but bookings are also open to independent travelers. Savings on selected flights may be substantial in comparison with other airlines. A round-trip ticket (May 17-24) was available this week from London Gatwick to Vallarta with Thomson Fly for just 419 pounds or 708 dollars (plus 79 pounds with a checked-in bag). The next cheapest flight, with stops in Newark and Houston, was 800 pounds with United Airlines. A May 31-June 7 flight was available for 559 pounds or 944 dollars. A round-trip ticket from Manchester to Vallarta (May 15-22) was even cheaper: 349 pounds or 590 dollars. The flights are only bookable from the United Kingdom to Puerto Vallarta and not the other way around.